Was able to visit the Casa Grande Ruins National Monument near Coolidge AZ. There is not much left to this ancient Hohokam Village but what remains is rather impressive given its 700 year battle against the relentless desert sun. Visiting sites like this give me pause to dwell upon the many footsteps that have tread upon the land throughout our human evolution. It is unfathomable to comprehend the amount of skill, ingenuity, and complete dedication to survival it took for these industrious people to not only survive in such a hostile arid climate but thrive. A few days ago, I got my cycle out for a short jaunt. It was a sunny February day and the snow had melted and there was no ice on the roads, it felt safe to ride. Given the melancholy bleakness of winter, it felt like a hot summer August day. Weather can be a matter of perspective. I went to school in Buffalo, NY where it rained and or snowed 6 days of the week. Snow drifts the size of houses are a normal occurrence in Western, NY and the snow will last from November through March. This Sunny February day felt like the Bahamas but the reality was that it was about 40 degrees. It felt good to ride again. I recently did a bunch of maintenance on my ride and she felt nimble and ready to pounce. As I was rounding a corner, I saw a golf course sprinkler system watering the greens. There was a brisk westerly wind pushing tiny droplets of water away from the golf course and onto the road. I automatically knew that given the temperature outside that the mist accumulating on cold tarmac would translate into a caustic situation. The fact that I was riding on a brand new front tire did not help the situation (Always Be Careful on New Tires). I was already in the curve and without thinking, I tried to upright my bike before going into the wet pavement because I felt that it may be ice. I am not right often but this time I was, that golf course sprinkler mist turned that corner into black ice carnage. As soon as I hit the patch of water, I felt my tires sliding out of control and that is when my brain went into slow motion. It’s like you’re thinking in normal speed but everything in your environment is moving at a snail pace. This has not happened to me since Iraq. In combat situations, sometimes things just slow down. Do you remember in the movie Saving Private Ryan when Tom Hanks is on Omaha Beach on D-Day and everything just goes in slow motion, that is what it was like. The funny thing is the first thought in my mind was the safety of my new Bell Helmet. It’s such a gorgeous helmet and the thought of it bouncing off the road chipping paint was just to horrific to contemplate. Then I thought of wanting steak and eggs with white toast, eggs done over easy fashion. Then I pondered my wife’s reaction, she would be so angry at me. I imagined being in a coma and having my wife lecture me for 43 hours straight on the dangers of motorcycling. Trapped in a coma listening to anti motorcycling propaganda sounded almost as bad as damaging my new slick painted retro lid. My last thought I remembered was hoping the dogs would be ok outside if I did not make it home till my kids got back from school. The beasts are inside dogs and it was a little chilly and hoped they would not be cold. Then as soon as it happened the cycle righted its self and I was off the ice driving safely forward. The moment lasted less than a second but it felt like 4 minutes. After further reflection, I am not sure about my contemplative priorities while getting ready to crash on the motorway. Luckily the crash never happened but it makes me think that we could all be only one second away from a life changing moment. Cherish the time you have on two wheels when you can get it and always let your loved ones know how much you care for them. I don’t fear crashing as much as I fear not being able to ride. Have you ever noticed the fact that motorcyclist tend to be individuals that normally diverge from the status quo. When everyone else goes straight down the road of life, motorcyclist travel a different path. We tend to have eccentric demeanors. Our focus is not laser pointed unless were deeply entrenched into a journey on two wheels. What we lack in focus we gain in individual perspective. Motorcyclist may lack money and fancy houses but we have awesome stories of phenomenal substance. Motorcyclist have a profound appreciation of life outside societal norms. We tend to believe in hard work and dedication to family but our minds drift through the surreal in search of harmony and bliss. The ride is not just about speed and adrenaline, it’s about searching our senses and our environment in a quest to find what is real in this life. Don’t get me wrong, I love the wondrous views and the remote sense of fear as I take that curve a little too quick but it’s more than that. 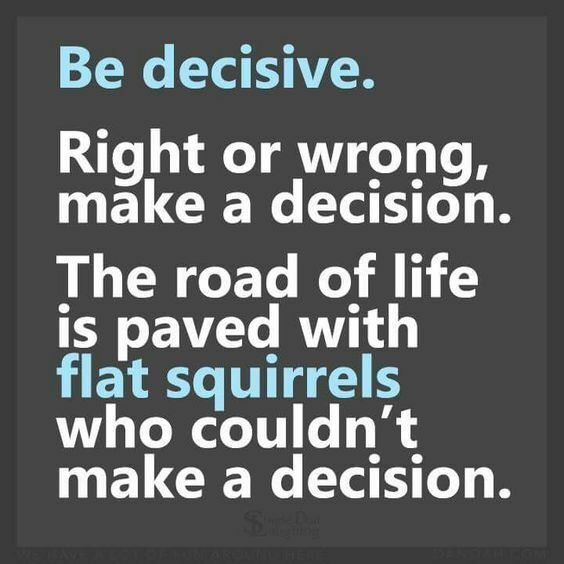 It’s about finding our own path and dictating our own terms in a world where individual thought is discouraged. Our continual search takes us all too a different spectrum of our environment. Our quest will never lead us to the same answers, were just too darn individualistic to share that same route. I have been working so much lately in an effort to do what is right for my family. I have no issue with my job but sometimes I feel that maybe it takes me away from what is real about life. In Denver, we have a huge homeless problem. Some of these folks are surely caught up in despair and bad luck. The gruesome cycle of poverty is no joke and I feel fortunate that I am still able to work and support my family. With that said, every once in a while as I pass a person I think is homeless and they look at me and I swear THEY THINK, “you look at me like I am homeless but you’re the one I pity. I may have no wealth or monetary substance but you are living a life of real poverty.” I never want to be homeless. I write this while camping in the mountains of Colorado in January. 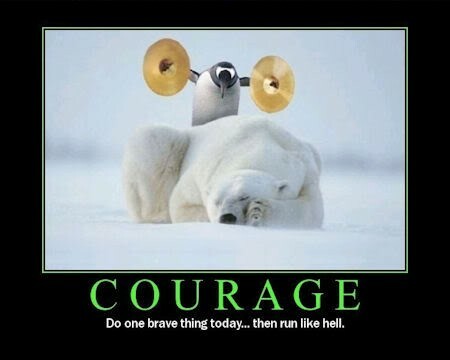 Its bloody cold out, my fingertips feel like little rocks as I type away at the keys. My hands and digits are stone cold and I shiver as my toes ask warmth but there is none to be found. I camp in the cold typing on my laptop knowing that I have a warm home awaiting me after my winter camping festivities which provides me eternal security beyond recognition. Homeless people do not have this option and this simple tragedy keeps me awake at night. Wow, I never want to be homeless and cold with nowhere to go. Most homeless surely do not want to be in their predicament and are looking for solutions to meet their immediate needs. I grieve for these individuals and hope they can find warmth and security. As bad as being homeless may be, is it possible that a few people choose to be homeless? We live such complicated lives and through simplification of our environment our minds become less cluttered with problems and worries. Henry David Thoreau wrote, “As you simplify your life, the laws of the universe will be simpler; solitude will not be solitude, poverty will not be poverty, nor weakness weakness.” I believe that there are a few individuals that choose this life style. These few persons, give up everything in their search for an answer. It’s an ALL IN Approach in their path to find knowledge. This is a journey I never want to follow but I respect their conviction and courage. One of the best books of insight I ever read was a novel called Siddhartha. It’s a spiritual word fest of enlightenment. When I was younger, this book answered many of my questions about what makes an individual truly rich. I still very much respect this book for its wisdom but I have found in my declining years that answers of this magnitude can never be answered by a book but must be answered by the individual seeking guidance in the matter. The answers are all relative and change with every individual. I believe that books will never truly answer our questions but are needed to help us find wisdom so we can answer those questions ourselves. Wow that was a tangent, I think I finally have succumbed to hypothermia. My toes are now numb and silenced. My hope is that I may be able to thaw them in my car. My fingers are now in a frozen state and lack the manual dexterity to hit the correct keys. It’s their way to punish me for writing in the snowy cold mountains in the middle of the night without any heat. One last thought, I do believe that there is something about riding that helps us open our minds to answers and wisdom. Maybe it’s a Zen Like state comparable to meditation that our minds transcend to while riding? All I know is that mind works differently when riding in a positive way and for that I am thankful. Keep the faith people, it’s already January. Soon the road will shed its winter coat. The cold and ice tear at my soul as I degrade to a frigid mental state. This is the pain of my discontent when it’s not feasible to ride on two wheels. I don’t weep alone, my cycle weeps for an adventurous sojourn and dreams of an escape through the vast open horizon. I can feel her urge to break her bonds of entrapment and together we wait. We wait for the daylight to come alive with a morning yawn and stretch its life to brighten our lives. Soon the darkness will be recede and our day will come to ride again. I have no photos to prove I rode the Loneliest Road in America. 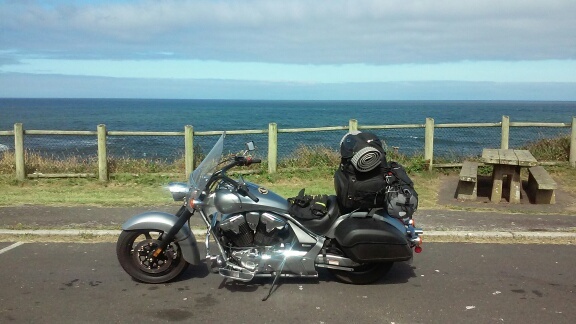 Forgetting to take photos for a two-week ride on my motorcycle has not been my finest moment as an amateur blogger. Over the same two-week trip, I also forgot to put on pants at a family re-union dinner. Oh yes, this is a true story. I walked into the room with a short sleeve shirt, shoes, hat and boxer underwear. I totally forgot my pants but luckily was wearing white boxer briefs which could almost count as shorts but are definitely classified as underwear. The whole family noticed my fashion blunder and I will go down in the family history as the dude that forgot his pants at the Family Reunion. Luckily shortly after that incident, I got back on my cycle to ride one of the most majestic roads in North America. The Loneliest Highway through Nevada is not just a clever name to increase tourism, it is legitimately desolate beyond compare. Think of the Desert Planet Tatooine in Star Wars and you will have an accurate representation of the isolated motorway. 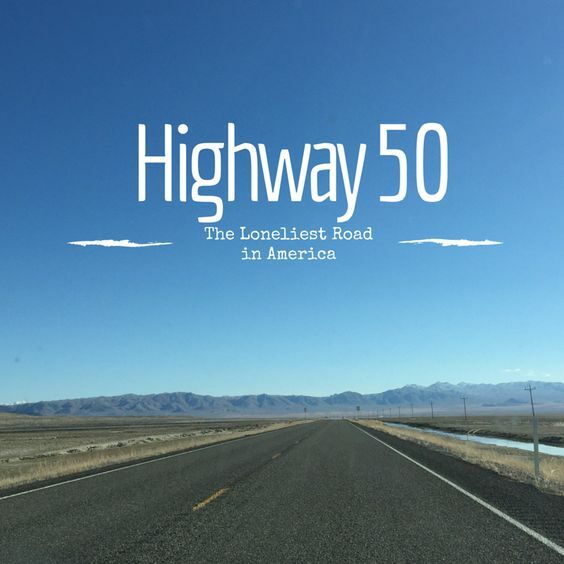 The Loneliest Highway is part of U.S. Route 50 which starts in Ocean City, Maryland and runs all the way to West Sacramento, California. Highway 50 has been named the Backbone of America which defines its rural spirit. The Loneliest Highway is a subsection of this interstate which is located in Nevada. This stretch of payment is a philosophical bikers dream. It’s not filled with wondrous curves or insane pathway cliffs but its barren landscape breeds independent free thought. In the desert, the lines of communication between our consciousness and soul become more linked and primed. 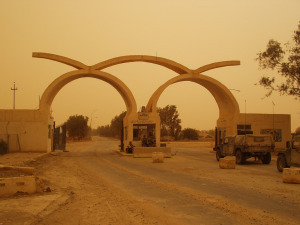 Back in 2003, I lived in the desert in South East Asia for a year. During this time, I wrote without abandon with more conviction and feeling then I have ever felt. This could be explained by many reasons but I always thought that the desert environment served as a muse which affected my soul directly leading to my literary expressions. It could be the open skies, the vivid sunsets, mesmerizing dawns, murderous sun or extreme deadly heat but for some reason, the desert enhances ones own own self perspective. 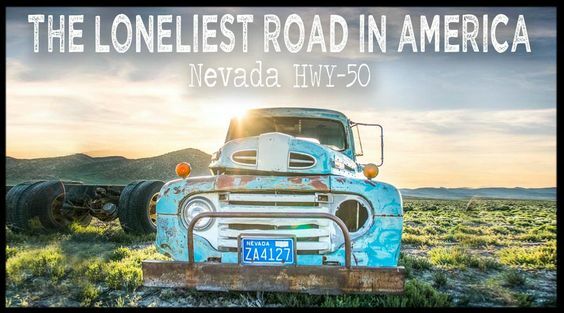 For me the Loneliest Highway started near Carson City, Nevada along U.S. Route 50 and ended in Delta, Utah. If you’re going to ride this isolated route, then be prepared for nothingness. For the first time in my life, I did my homework. My research found a limited amount of Gas Stations along the way. I packed an external gas reservoir, to supplement my small gas tank. This was absolutely needed and was used on multiple occasions. Sun block is needed and a lot of it. With every stop, I applied sun block. I found that the scent of the lotion much better than my natural odor (showers were limited on my trek). There are plenty of places to camp for free in National Forest and Bureau of Land Management Property. Watch out for small desert creatures that can ruin your evening if you choose to sleep under the stars. I traveled with a foam bed roll, sleeping bag and fully enclosed bivi shelter. I am a huge wimp; the thought of waking up with a rattlesnake in my sleeping bag or scorpion on my forehead makes the bivi shelter and absolute essential for desert camping. Don’t be fooled, it may be scorching hot during the day but at night the temperature drops and a sleeping bag is mission critical. Sitting under the night sky while camping on the Loneliest Highway is one of the most peaceful environments I have ever witnessed. The sounds of the desert, vast star infested atmosphere and the loneliness of the place, transfixed my emotions and brought me into a dream while still conscious. It’s a great place to be with one’s self and ponder life’s many conundrums. I rode from Denver, Colorado to Lincoln City, Oregon a few weeks ago. I spent about 10 days on the road. I have only one photo of the whole trip. The picture is of my cycle gazing upon the Pacific Ocean and is attached above. It’s rather strange that I did not take more photos of this trip. Think about it, how many people take multiple photos a day of things like their meal or random snaps of grass growing. I travel half the country and only take one lame picture. I did not even notice until I got back home that I was basically photo less. Take more photos is on the need improvement list for future trips. My Honda Interstate was so comfortable on this sojourn. I set it up for a long journey by adding an engine guard and additional foot pegs. I used to get major aches while riding on long treks on my old cycle (FJR). I was pain free this go around; the only reason why I had to stop was to get gas. Another added comfort was using one of my bags as a back rest. The back rest is a must have. One last tip, a cool way to store a tent and sleeping bag is to use a water proof bag and hook it on a luggage rack with zip ties. The concept worked great and your sleeping provisions will be guaranteed dried when it’s time to pull over and set up camp. Remember your essentials on a long trip which are zip ties, duct tape, multi-tool, sun block and flip flops. Nothing like putting on flip flops after a 500-mile ride. Leave your schedule and sense of punctuality at home. What 4 Motorcycles Would You Choose? We ride for so many reasons. When I first started to ride, it was for the adrenaline rush and for the adventure. To this day my adrenaline still flows on every ride and each journey I take on two wheels is still an adventure. My passion of riding has become more than a physical reaction to speed and new scenery. It has become a real mental escape for my soul. Our bikes take ourselves away from the world and we have the opportunity to ponder thoughts and dreams which may be out of reach without the help of our motorcycle explorations. It does not happen much but every so often when riding, I will think of a worldly issue such as bills, personal problems and work. During such interruptions, I will quickly squash the thought. There is no room in my head for such negatively while riding on my motorcycle. When I first started riding, I would always contemplate my life’s concerns while riding which took away from the experience. It took me years of training my mind to reserve the use of my brain to focus on road safety while riding instead of thinking of everyday problems which were vexing me. This focus on road awareness eventually lead to a change of what I observed while riding on my motorcycle. The external environment I viewed while riding became more vibrant and real. The color of the trees and flowers I passed jumped out at me, the smells of the road were more pronounced and the sounds I heard became clearer. I also found that putting my worries aside while riding opened up my imagination to original thoughts and perspectives which I would have never experienced when caught up in life’s mundane apprehensions. I am so grateful for riding b/c it’s the only place where I can truly take myself away from reality and dwell on items of philosophical importance to me. It is truly ironic because my mental focus on road safety eventually lead me to have more free form contemplations then I have ever had previously. There is an issue with daydreaming to deeply; sometimes my mind begins to focus more on my free thoughts then keeping safe on the road. So for me it’s a delicate balance of keeping safe and being able to day dream of thoughts that I can rarely ponder anywhere else. Many people would state that we must only dwell on looking for escape routes, dangerous situations, and other perils while riding. That is a priority but if done safely, day dreaming is a priority as well. Can an individual focus on safety while riding a motorcycle as well as ponder life’s mysteries? I believe this is possible and would argue that the riders focus on self-preservation actually opens one’s mind to deeper emotional thought. When off of my motorcycle my mind seems to dwell mostly on items of immediate importance such as work, keeping up with my daily schedule and thinking of immediate needs like what’s for dinner. When on the motorcycle my brain just goes to a deeper place. It transcends the now and motors off to a different universe where I am free to dream and not be burdened by life’s problems. Maybe this is due to the fact that if I hit an oil slick and slide of the road, none of those every day concerns will be of any consequence. My mind is still hyper-focused on the dangers of the road but it’s also more open to thoughts and ideas that are not normally a priority in my everyday life. This is what I love most about riding; it gives me the ability to escape my own head.